When a large number of parts have to be made from the metal that is in one bar then are are possibly three ways of doing this. If the diameter of the bar is small enough to fit in the bore of the spindle then it is held in the chuck so just enough for one part is sticking out of the chuck. The end of the bar is turned as required. This part is then parted off. The bar is pulled out of the chuck for the next part and so on. 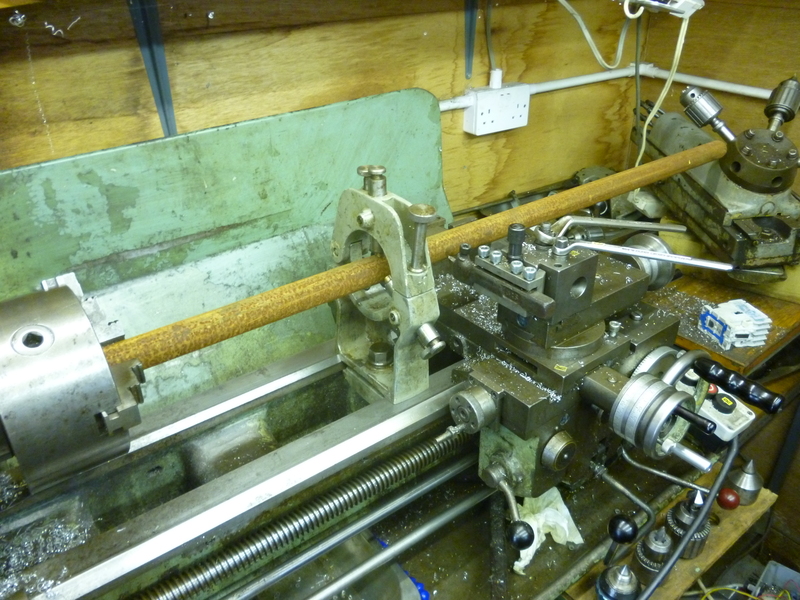 The problem arises when the bar is to big to fit in the bore of the spindle. There are two ways of dealing with this. The first is to saw the bar up into short pieces. Each piece is long enough to hold it in the chuck and then have enough sticking out of the chuck to make the required part. The end is turned as required. This part is then parted off from the bit in the chuck. This requires a lot of sawing. There is also a lots of bits of bar left over. The proper way to do this job is as follows. A piece of bar is held in the chuck. This is the longest length that can be fitted in the chuck and which can be machined at the other end.. Of course it cannot be machined like this. It has to be held near the far end using the fixed steady. The far end is then machined. The part is then parted off. The steady is moved back so that the next part can be machined. This is repeated till the whole bar has been used up. for this sort of job the fixed steady can be set up adequately simply by fitting it onto the workpiece just at the point where it comes out of the chuck. In the first case if the part is 25mm long and the bit held in the chuck is 25mm then half the bar is wasted. In the second case the wated material will be about 25mm in the chuck and about 3mm for each parting off.